One of the best brain exercises you can get would be the chess. 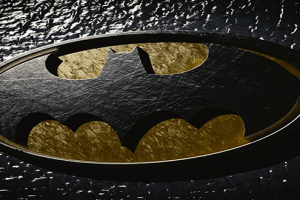 It was popular back in the 1950’s and 1960’s and yet it’s played widely around the world. 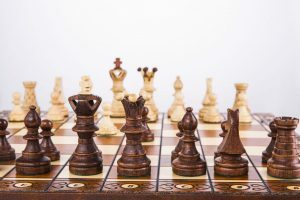 It’s not important where and on which chess set you are playing it on, however, having a chess set you will like and enjoy boosts your motivation and can keep you playing for hours. Also, it’s more enjoyable and it’s easier to play on a chess set which has nicer look and better features. 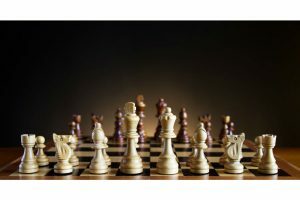 That’s why in this post you will be able to find some of the best glass chess sets down below. 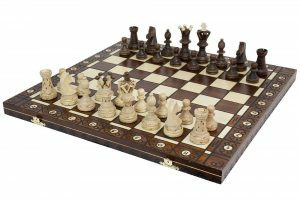 It’s a wonderfully elegant chess set which comes with glass chess board which feature alternating frosted and clear squares. 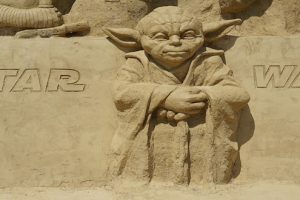 However, the feature isn’t only for decoration purpose. It’s playable and fully functional. However, not only the glass board is frosted and clear but glass chess pieces are frosted and clear as well. That’s what makes this glass chess set unique, but also the ability to be able to play checkers as well. At first, it looks like that there are no squares at all, when on the other hand when you have a better look you realize the special feature of this glass chess set. 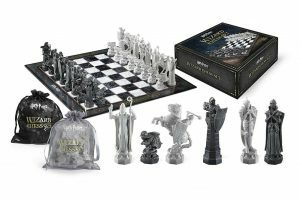 In my opinion, it’s very unique and I would definitely love to play a chess game on this set. Size of this glass chess set is 9.75 x 9.75 inches and it is 13.625 inches when measured diagonally. The glass chess board has rubber feet at the bottom to prevent the board from slipping but also to prevent the surface underneath from scratches. This decoration is absolutely amazing and I am sure that every winter lover will love it. It’s a great chess set to use when it’s snowing outside to match the theme. Pros of Elegant Glass Chess Set: Unique design, ability to play checkers as well. 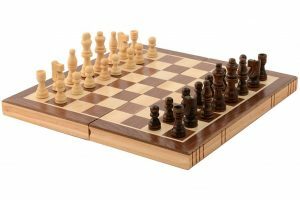 Cons of Elegant Glass Chess Set: There are complaints that the board is simply clear glass with dark squares having a slightly higher opacity than the clear. This chess set looks just like every other normal set with no special decorations, however, I must mention that it’s made out of the glass. It’s a clear glass board and only has black prints on it which makes clear squares adapt to the surface underneath. Also, the glass chess pieces are clear and black which makes it look very nice on glass board. 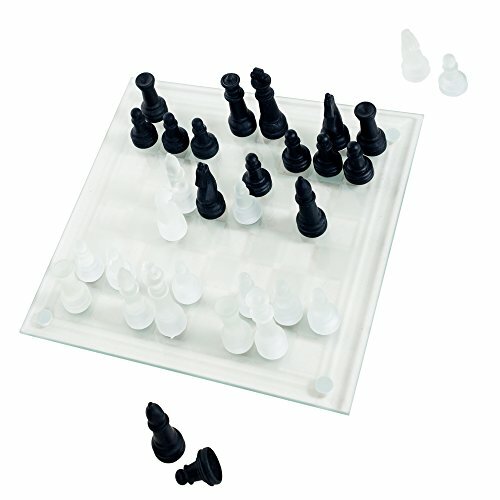 The chess set looks very stylish and white & black contrast looks incredibly good on the glass surface. 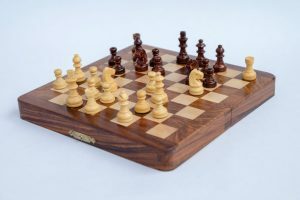 It makes it modern but still unique chess set. King measures 3 inches and the set includes 32 chessmen. 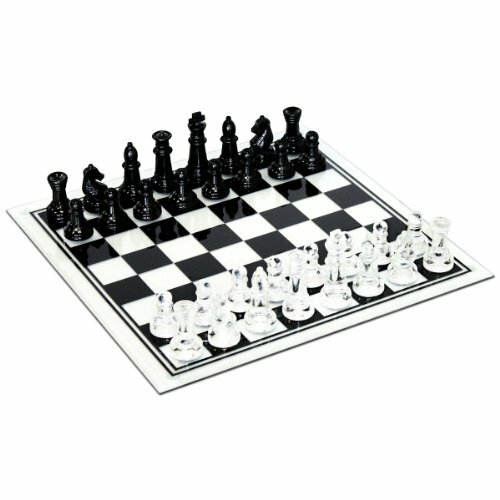 Pros of Black and Clear Glass Chess Set: Modern design with unique style, glass chess pieces which suit the glass chess board. Cons of Black and Clear Glass Chess Set: Complaints that the edges aren’t cut properly and aren’t finished to the quality that is expected. Since in this post’s list, we have only unique glass chess sets – this is one of the unique glass chess setsout there. The best feature of this chess set is that the figures glow when they are on a board or near the board. Which means, once you eat opponent’s figure and lift it up off the board, it’ll stop lightning. Glass board is made out of high-end glossy black glass material which fits the figures perfectly. 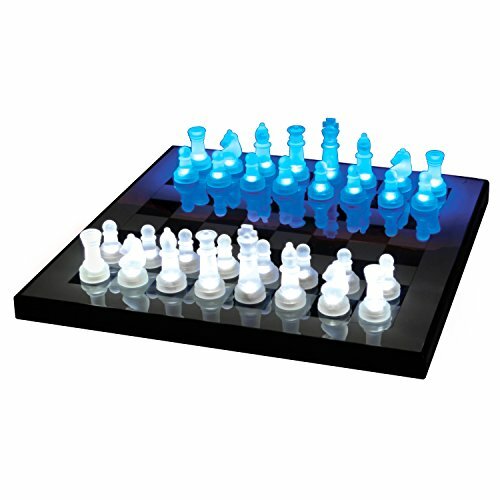 The best thing about this glow chess set is that you will be able to play it even in the dark. You can take it anywhere and it will glow thanks to the 4 AA batteries which are needed or simply use the power adapter which is provided. Chess pieces are white & blue, and there is a red & blue version which in my opinion looks even better. Pros of LumiSource Lightened Glow Chess Set: Unique chess set which is glowing, high-end glass chess board. Cons of LumiSource Lightened Glow Chess Set: Works as advertised, however, quality control is lacking. 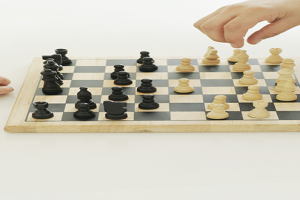 Have you ever imagined how fun would it be to play chess on a mirror chess board? Well, this mirror chess board isn’t a simple mirror. It’s a mirror which has squares with black and frosted opacity. Chess pieces are black and frosted which really suits the mirror chess board. I can imagine how fun it would be to take it out and play it in the park for example, as you will able to see all kind of reflections on the mirror chess board. And the best thing is that it wouldn’t distract you from the game as squares have black and frosted opacity, so you will be able to still enjoy your game. The king is almost 3 inches tall which is always a nice feature when compared to the queen which is a little bit smaller. The board size is 13.75 inches when measured diagonally and it weighs only 5.5 lbs. Pros of Mirror Chess Board: Unique mirror glass chess set, black and frosted chess pieces, looks stylish with the reflections on the side of the board. Cons of Mirror Chess Board: Chess set might be better if the frosted squares were replaced with the white squares instead. 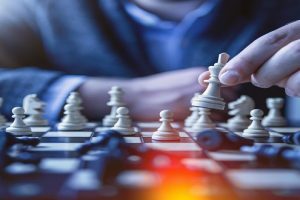 You could spice up your chess games with one of these beautiful unique chess sets which are really amazing for their price. Also, if you are maybe building a collection of the most unique and stylish chess sets, in my opinion, all four of these could be a part of that collection. I really like glass chess sets because they are unique and each set is different no matter that all of them are made out of the glass. Also, as they are really inexpensive, they could be the perfect gift for someone who loves to play chess. Which glass chess set is your favorite from the list above? Feel free to share your opinion in the comment below, but also feel free to ask any questions you might have.